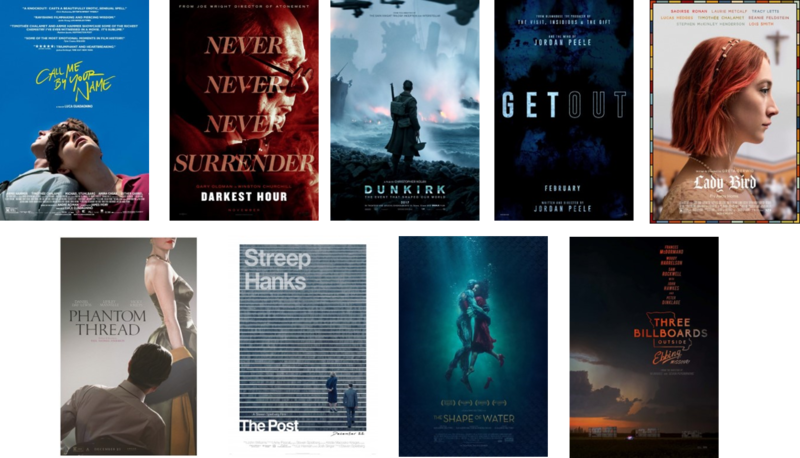 I can’t understand why a field as wide as ten potential nominees couldn’t make room for two of my favorite movies of the year, both of which had good if not spectacular momentum: “The Florida Project” and “The Big Sick.” Both earned just one nomination apiece. Other high-profile omissions include “I, Tonya,” which scored a PGA nod in addition to its Golden Globe bid for Best Motion Picture – Comedy/Musical, PGA nominee “Molly’s Game,” which picked up just a screenplay bid, and PGA nominee “Wonder Woman,” which ended up with a grand total of zero nominations. “Darkest Hour” and “Phantom Thread” charged ahead to receive much bigger totals than expected. “The Post” earned just one other bid, for actress Meryl Streep, while “Call Me By Your Name,” “Get Out,” and “Lady Bird” also earned relatively small hauls. “Three Billboards Outside Ebbing, Missouri” missed out on a director bid, likely negating its chances to win, leaving it between “Dunkirk” and what’s by now the established frontrunner, with 13 nominations, “The Shape of Water,” which also happens to my clear favorite among this bunch. My current bet to win: I’m going with The Shape of Water.